Seeing your children grow year after year is one of the most rewarding experiences of parenthood. As they age, your kids begin to follow your lead in every aspect of life including hunting. Their passion for the outdoors and hunting is budding, and you have to make a decision as to when it is time to introduce youth hunters to shooting. 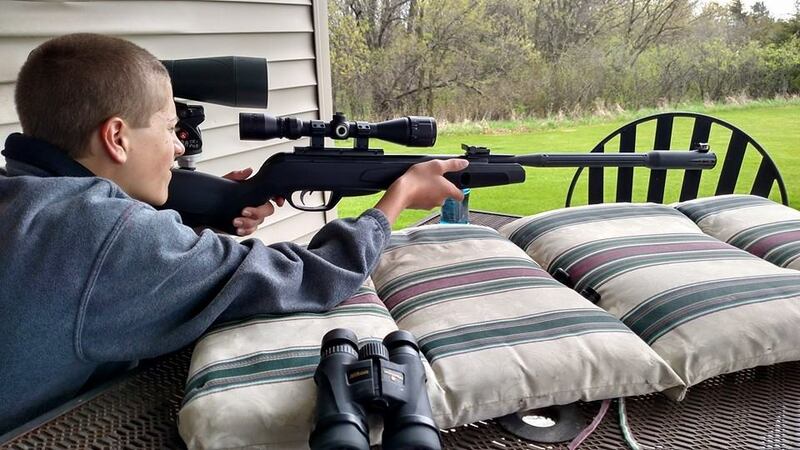 Youth hunting starts at the range and the sooner you can introduce them to shooting the better. What is the right age to introduce youth hunters to shooting? That is completely dependent on you and the child you are introducing to shooting. Every child is different. The decision to start teaching your youngster the basics and safety of proper shooting and handling of firearms is something that requires the upmost confidence in your own skills and those of your young hunter. 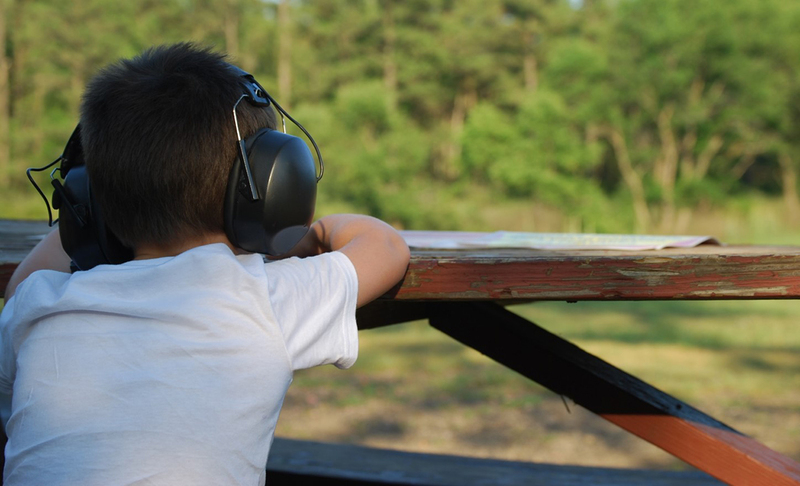 Here are 5 tips to help you to be successful with introducing kids to shooting on the range. Not all kids are ready to start shooting when you are ready to teach them. Do not force shooting on them but rather let them start when they are ready and show an interest. Too much pressure to start shooting can quickly turn them off. Youth hunters should move forward at their own pace with some guidance and be comfortable with shooting. Caliber choice basically comes down to either an air rifle (BB-gun or .177) or .22 long-rifle for those youth hunters who are just learning to shoot. Anything more and the recoil can be too hard to control and could easily scare kids away from learning to shoot. Make sure the gun is the right fit for your new shooter. Ill-fitting youth hunting guns are hard to shoot for kids. Children should feel comfortable while shooting so they are more safe and more on target with each shot. Start by going over all the parts and functionally of the firearm you have chosen to shoot. Keep it simple but be detailed enough so your youth hunting partner knows the basics. Next, determine your new shooter’s dominant eye and shooting hand. Discuss the fundamentals of a good shooting position such as a solid rest, secure grip, breath control and trigger squeeze. This should all be discussed and practiced with an unloaded firearm. Once both you and your child feel ready, take it to the range for the real thing. After going through the fundamentals, demonstrate your instructions by going through the same fundamental steps yourself. Shoot a few rounds from the same youth hunting gun he/she will use. Show your youngster exactly how to complete each step, from loading to pulling the trigger, so that they can see how the process unfolds in an actual shooting scenario. Once you have your youth hunting partner interested in shooting, have the right gun and have gone over the fundamentals, it is time to shoot and shoot often. Keep shooting fun. Days on the range firing round after round at a simple white ten ring will quickly lose your kids interest. Use targets that imitate animals like squirrels and groundhogs. Don’t just shoot at paper targets either. Metal dingers of different sizes are fun, and the shooter knows right away whether or not they hit their mark. The same five tips hold true for youth bowhunting. More importantly with youth bowhunting is finding the right kids bow that your child can manage to hold comfortably and be able to draw successfully. Find a youth bow that has an adjustable draw length and weight. This will allow the bow to grow with your child from practicing to hunting without having to purchase another new bow as they grow. Finally, as with introducing kids to gun shooting, make bow shooting fun for kids. This will keep them engaged and hungry for more time on the range. Youth shooting at the range should encompass every aspect of the activity. In addition to the fundamentals and actually shooting, do not forget to explain the rules of the shooting range and range etiquette. This is important, not only for safety but to be courteous of others shooting. Absent from the tips above is safety. It was not left out because it is not important. On the contrary, it is so important that it requires its own section. Teaching children gun safety is the number one priority when shooting. There is too much at stake to be careless with safety when it comes to kids shooting a gun or a bow. Even more important is to teach the right safety procedures to youth hunters from day one. First, always keep the barrel of the firearm in a safe direction at all times. Never point a weapon at anything other than a target or game you are hunting. Second, treat every gun as if it were loaded. Do not take for granted a firearm is unloaded and additionally keep guns unloaded until you are ready to use it. Third, be sure of your target while shooting. You must always know your surroundings. Know what is in front of, behind and around your target. Fourth, keep your finger away from the trigger until you are certain you are ready to fire the weapon. Safety with the firearm itself is important, but so is safety when it comes to shooting. Always wear ear protection and safety glasses when on the range. Be aware of your surroundings at all times because you cannot be sure those around you shooting are practicing the same safety measures you are. As you build confidence and the skills needed to be a successful young shooter, there are additional ways to get more opportunities at the range. Check with your local sportsmen club for youth shooting days or classes. Some gun clubs even hold youth shooting leagues in air rifle and .22 Look into youth shooting opportunities with your county or state 4H. Frequently 4H will host shooting camps or demonstrations for young hunters. 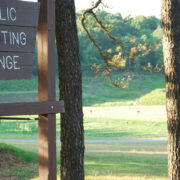 For those starting to shoot archery, most outdoor summer camps typically offer archery shooting at some level. 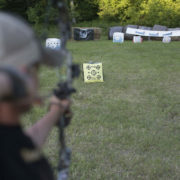 Specialized youth summer camps like the Raised at Full Draw Bowhunting Camps go into great detail not only on proper shooting techniques and safety but also bowhunting skills that help young outdoors people excel at the sport. To sum up, make shooting as fun as possible for youth hunters. Take time introducing youth hunters to shooting. Explain the fundamentals and demonstrate the proper way to handle and shoot a firearm. Address safety in a deliberate and serious manner. If we teach our children to respect shooting at a young age, they will carry that respect for firearms throughout their youth hunting and into adulthood. The heart of summer can be discouraging for most archery hunters. Opening day of deer season is a long wait for any avid hunter, but there is more to do than spend your days sitting around moping about it. Take this opportunity to increase your bowhunting education in preparation for the much anticipated fall season. Has there ever been a time when you have made a poor shot or lost your concentration under the pumping adrenaline as that shooter buck stood just yards from your stand? Most archery hunters can confess they have on at least one occasion. Adding the right archery tips and techniques into your bowhunting education strategy will make sure you are ready when the time comes. 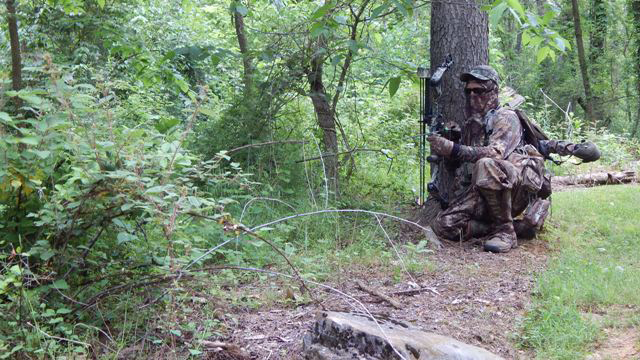 Use the down time this summer to improve your archery education and practice like you hunt. Every hunt is different. There is no telling what situation you may be in when that trophy whitetail shows himself. Are you going to be in stand our perhaps sneaking down a trail during the afternoon? Part of the lore of hunting is these unscripted moments in the forest or field. One thing guaranteed is that the moments leading up to taking that shot will be full of excitement just as your arrow leaves your Bear Archery Bow. Simulating as many real hunting scenarios as you can into your off season archery practice can prepare you to be confident and certain when that long awaited situation comes to let the arrow fly. Nailing arrows, one after another, into the vitals on your 3D target will not make you a better hunter. Most of us practice in the off-season but few truly increase their bowhunting education to a point where it needs to be for year after year archery hunting success. The most important archery training tip is to practice like you hunt. Few have harvested a whitetail at 15 yards broadside, standing with feet perfectly square, calm and under no influences from the weather. Archery education is about taking your practice to a higher level. It is about understanding how your equipment will perform in different conditions. Dedicate time to create your very own mock-hunting experiences that you can share with your friends and family. Practice shooting from tree stands, ground blinds and on the open ground, all while varying shot types in these positions. Also, practice while suited up in your hunting clothing so that when you pull that bow back each shot is as real as it can get. The goal is to eliminate any surprises in the woods by practicing as many situations as possible. There are endless mock-shooting situations to practice that will increase your archery education. Practicing situations not only prepare you for shots that you may encounter this fall but also gives you the confidence to make the accurate shot when the time comes. Most hunters choose to pursue deer from tree stands, yet many only practice by shooting in the back yard on the ground with level shots. A critical archery training tip is if you plan to hunt from a tree stand then you should be practicing from a tree stand. Hang a stand in the back yard at elevations you would typically hunt from and position targets at various angles to make shots more realistic. Place targets in brushy cover areas as well so you can practice unexpected and more difficult shots that are typically in real hunts. Another archery training tip is to take shots while sitting in your stand. Sometimes you do not have time to stand and position perfectly towards an incoming buck. These shots are difficult and not ideal, but sometimes the only shot you may have on the buck of a life time is one that puts you in a seated position. Even though many of us hunt from a tree stand, there comes a time when that perfect shot may occur from the ground. Either while walking to your stand in the afternoon during the rut or simply taking a stalking trek to break up the day; you should be prepared to take a shot from the ground. Start with shooting from your knees, again in realistic situations like in cover. Work with using your Nikon range finder to sight the distances; do not just set and shoot at predefined ranges. Rarely does a buck come in and stop exactly at 20 yards. Part of this bowhunting education is about understanding how your bow shoots while kneeling. Is there enough room to draw without your clothing or other archery equipment getting in the way? Many of these questions can be worked out now by taking a few shots from ground situations in the summer. Your bowhunting practice strategy is about making as many awkward shots from different positions as possible so that when it comes to making the same shot at an animal it comes natural. Creating the most realistic practice will ultimately build enough confidence and experience to make your shot count when the moment of truth surfaces. Practice these different kinds of shooting situations to perfect your archery education going into next season. The advancements in bow performance and technology have shooters being able to extend their shots well beyond the traditional 40 yard distance that was once the stopping point for taking a shot on a deer. Leveraging these advancements means you have to increase your archery education to a point where you can understand how to effectively use it while hunting. Practicing long-range shots also makes closer shots easier. Adding these few archery tips for accuracy will put more meat in the freezer and more trophies on the wall. Things change exponentially when you start to shoot out past 40 yards when it comes to bowhunting. Just like practicing from tree stands or from the ground, your stance is important. Any unbalanced position magnifies error for shots that are even the slightest off target. Increasing distance also means you have to develop a proper grip on the bow. Relaxed grips help to reduce torque on the bow. The less torque the more accurate you will be shooting at greater distances. Many hunters put more grip on their bow handle when shooting at longer distances, but remember you want an open grip that sits into your palm to remain stable and accurate on release. Once you release the shot, the tendency is to drop the bow out of the way to track your arrow in flight until it hits your target. Shots at long range can take what seems like forever to reach your target even with today’s speedy bows. Keep your head on point the whole way through the shot until the arrow impacts. This will make sure you do not inadvertently jerk the bow as the arrow leaves the rest affecting the accuracy of the shot. The two most important archery tips for accuracy at long ranges have nothing to do with form or even your equipment for that matter. To shot consistently well over 40 yards it takes breathe control and the confidence in execution you have from countless hours practicing. It can be intimidating to draw at a deer out at 40 yards or more. This nervousness usually forces you to hold your breath and tighten up. Resist this reaction! Holding your breath causes you to shake and lose focus on your target. Consciously practice breath control on long shots to keep the oxygen following while focusing in on your target. As your distance to target increases, there are so many variables that are out of your control such as how the animal may move or what obstructions may impact your shot that you did not see while aiming. All that you can do is have the confidence in your execution and your archery education to execute the best possible shot. Now that you have taken the time to build your bowhunting education, summer is the perfect opportunity to increase your kid’s archery education. The same archery tips and techniques can be passed along to your kids or another person that is getting started in the sport. Not only teach proper and safe shooting with a bow but also give them the knowledge you have on wildlife, game care, ethical hunting and outdoor skills. Youth summer camps can be a great option to get your kids outdoors. 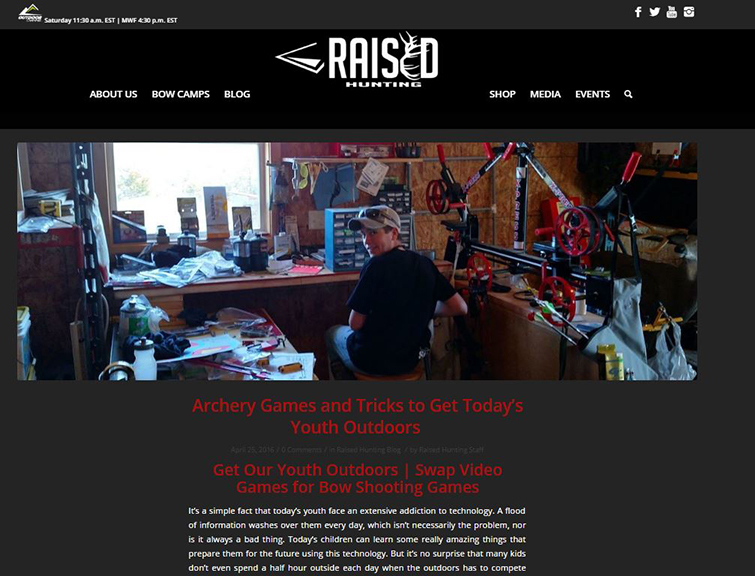 Raised at Full Draw (RAFD) bowhunting education camps are one of the best camps if you are looking to build archery education in your next generation hunter. Summer programs for kids like RAFD camps promote archery skills, hunting and outdoor education like no other. Kids are giving the opportunity to practice immediately the skills they are taught. They leave each camp with an increased appreciation for hunting and the outdoors while building the archery education needed to be successful at the sport for years to come. 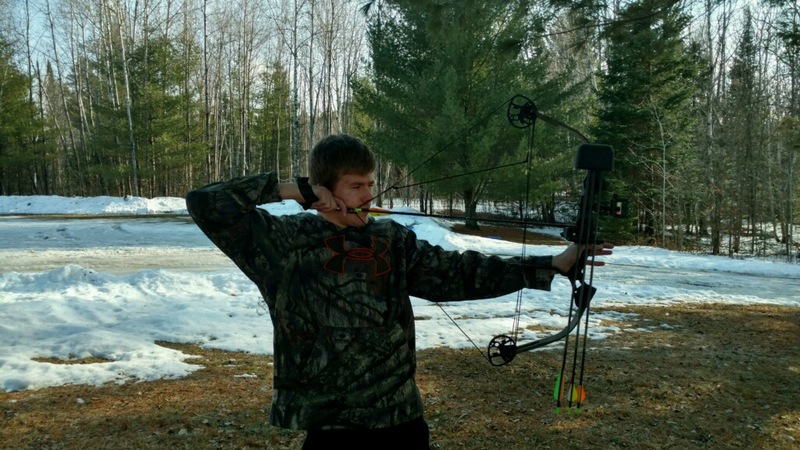 Bowhunting Education – Raised at Full Draw (RAFD) Bowhunting Camps. (Video) – Promoting archery, hunting and outdoor education for the next generation. Practicing archery shooting has to also be fun, either with kids or with yourself. Not every practice session should be rigorously working on the archery tips and techniques discussed above. Incorporate archery games and tricks into the mix to not only keep interest but make practicing and the sport enjoyable for all. Bowhunting education is something that never stops. Each off-season should be a time gather the lessons of the past hunting season and improve your archery skills. Summertime can also be a break from hunting to get kids involved in archery through different summer programs for kids like RAFD camps. Work on practicing like you plan to hunt. Take shots from situations that you expect and do not expect to happen in the upcoming season. Incorporating the right archery tips and techniques into your archery education strategy will only yield more successful hunts. Surely you’re familiar with the popular idiom, “Give a man a fish and you feed him for a day. Teach a man to fish and you feed him for a lifetime.” Here’s a surprising fact for some: this isn’t just about crappie tactics. It’s really about the value of teaching over just doing for someone else, which is especially true for youth hunting. Most of the time with children, it’s just easier to do something for them (e.g., tie their shoes, answer their math question, etc.) instead of teaching them how to do it themselves. But they’ll never learn and will always depend on you for that task. As parents, it’s critical that we equip our kids with the knowledge and skills to grow up and do things on their own. This is an extremely important lesson for youth hunting. Sure, we could always feed our kids venison. But that’s cheating them of the amazing experiences that the autumn woods hold for archery fanatics. Bow hunting doesn’t just teach us about the natural world, the resilient wildlife species that inhabit it, and food awareness. It also teaches us virtues like patience, respect, ethics, confidence, responsibility, and emotional control. It doesn’t take much imagination to agree that more children would be better off as adults with these traits. But on a larger scale, hunter recruitment and retention is extremely important for anyone who enjoys the great outdoors. Hunters are consistently at the forefront of wildlife conservation and habitat restoration efforts. As hunter numbers decline, so too does the funding and interest in these causes. Introducing children to the sport is the cure-all solution. Here are some tips and techniques to help introduce your child, relative, or family friend to youth hunting. One of the first and most necessary things you should do is to get your youth interested and excited about hunting. This is fairly easy to do as most young kids are fairly interested in wildlife and nature already, but some will take to it slower than others. Have them watch your favorite bow hunting programs, such as Raised Hunting. Take them on walks in the woods or farm to explore new things. 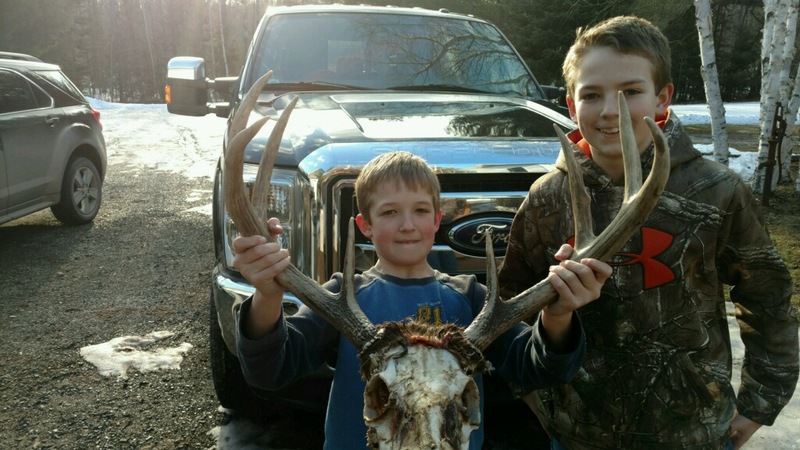 In the late winter and spring, take them with to go scouting and shed hunting. Teach them why deer rub trees and shed their antlers, and make it feel like a scavenger hunt. If they get tired or bored, accept that their attention spans will be shorter and be willing to leave early. Try sitting in a blind with them where they can get away with some fidgeting and movement without spooking wildlife. Hopefully they can watch turkeys and deer at close range and feel the excitement that goes with it. Also show them the animals you harvest with your bow, so they can get an up-close view of the animal they are chasing. Make your excitement contagious when you’re showing them so that they can feel the same way. This stage needs to focus on keeping things fun for them. You don’t want it to become a forced march for them against their will. If they have to hike long distances and get yelled at for goofing off, they may not be so inclined to go out again. The biggest thing you can do to help is just trying to have fun while you’re outdoors with them. Try not to be as rigid as you usually are while archery hunting on your own, be willing to laugh and joke with them, and don’t scold them unless it’s a dangerous behavior. The fun memories are ultimately what will get them to come back to try it again. If they seem interested in being outdoors and hunting in general, the next step is to get them their own youth hunting gear and a bow to practice with. Start young kids (i.e., 5 to 10 years old) off with a small compound bow that’s easy to pull back, such as the Bear Archery Scout compound bow for kids. Also be sure to grab some Gold Tip Falcon 35 Arrows, and a Tru-Fire Junior Release. You can even use round-tipped play arrows for a while. They can practice with these to grasp the basic concepts and safety considerations until they are able to use a youth compound bow. Most states allow youth hunting with a bow at ages 10 to 12, provided a licensed hunter accompanies them. You can find youth compound bows for sale at almost any sporting goods store, like SCHEELS, near you or bear compound bows for kids through Bear Archery. Either way, they can help you find one that fits your child well. Like any hunting gear for kids, it’s tricky business because you don’t want to get one that’s too large for them, but don’t want to buy a new bow every couple years as they grow. Try to find a happy middle ground between these two approaches. Regarding the size, a proper bow shop can match a bow to your child’s frame, and determine the best draw weight. Start small at first (i.e. generally around 15-20 pounds), but allow them to work up the strength as their form improves. If you start too heavy, your youth may pick up some bad habits that will need correcting down the road. They won’t enjoy practicing and it could even discourage them from continuing to hunt. Once they’ve got good youth bows to fit them, you need to make sure they practice. As with any skill, the more they practice, the better they’ll get. The same is true for youth hunting. But as in the first step above, you need to keep it fun for them. In other words, don’t tell them they “need to practice 20 arrows a day or you’ll never be good enough to shoot a whitetail.” Hopefully that’s common sense, but it needs to be stated. Instead of that approach, get them interested in practicing on their own by setting up a small 3D target range in your back yard or taking them with to an archery range. When they get to shoot at anything from whitetails to dinosaurs to aliens, you can bet they’ll stay interested. Even for adult bow hunters, it’s nice to have some variety! Get them comfortable shooting from ground level before moving to an elevated position. If they seem really interested, you may want to send them to youth summer camps to learn some more archery skills, practice with peers, and just generally have a fun time. 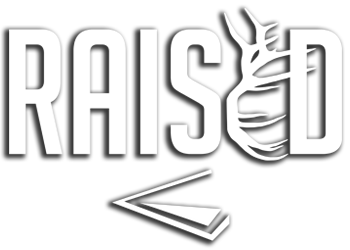 The Raised at Full Draw (RAFD) bow hunting camp exists to help youth learn archery and hunting techniques through hands-on outdoor education activities in a fun camp style of learning. It follows the curriculum of the National Bowhunter Education Foundation (NBEF) book, and ultimately does lead to bowhunting education certification. Another nice way to keep them practicing is to start a weekly family bow hunting practice session, where the whole family gets to work on their shooting skills. A family that bow hunts together stays together. Or at least that’s what they say, right? Keep it interesting by playing different archery games and challenging each other in friendly competitions. For example, the best shot of the week gets to choose a fun meal for the family. Or perhaps they get out of doing dishes or mowing the lawn that week. If they’ve practiced like we discuss above, they should be ready for youth bow hunting in a real situation soon. You’ll have to make that call based on the accuracy, consistency, and dedication of your youth. It’s usually required to sit with them during the youth hunting season the first couple times in a blind or tree stand, so you can advise them in a pinch and observe how safe they act in the tree stand. Set them up with a Rage broadhead to ensure their quarry won’t go far. If you feel like they are acting safely and responsibly, and could ethically make a good shot, you may decide to let them hunt on their own the next year. This can be a nerve-racking decision, but you have to let them “fish” on their own at some point. Congratulations! You helped create a potentially lifelong bow hunter, who will likely teach their kids and others someday, thus ensuring the future of our cherished sport. And if we all introduce at least one child to the tradition of hunting, our future looks brighter than ever.